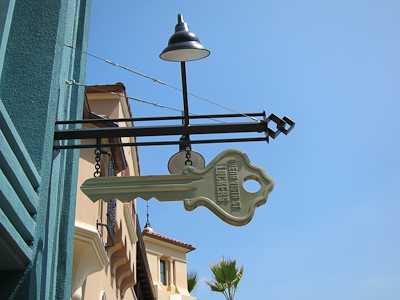 Over at Disney California Adventure (aka the Mouse-Next-Door), a new entrance plaza is unveiled–Buena Vista Street. 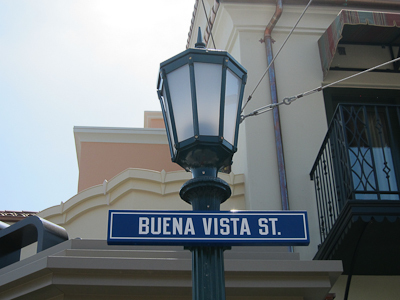 Just as Main Street, U.S.A. is supposed to represent a small-town main street at the turn of the century, Buena Vista Street represents the streets of Los Angeles as Walt encountered them when he stepped off the train in 1923. Which incidentally is the year after our house was built. 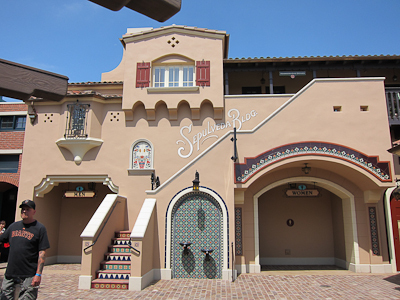 Anyway, replacing “Sunshine Plaza” (of which I was never a fan), Buena Vista Street is everything you would want a park entrance to be, and more. Like Main Street, the details are exquisite, from the architecture to the window displays, everything is lovingly detailed. For the preview we entered through a super-secret doorway in the walls. By the time you read this, you’ll be able to walk right in. You’re immediately hit with some amazing buildings. 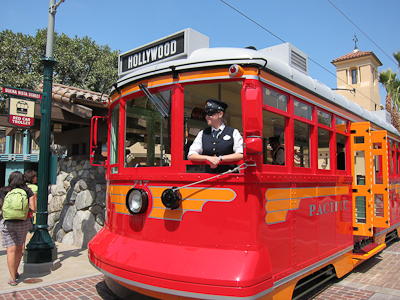 And one thing members of my family are particularly looking forward to–the Red Car Trolley. 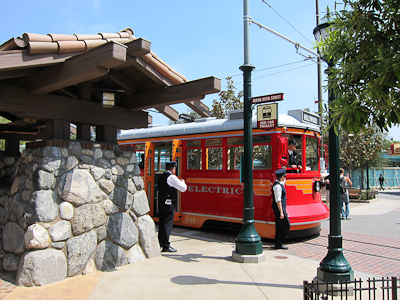 The Red Car Trolley is a real working trolley. 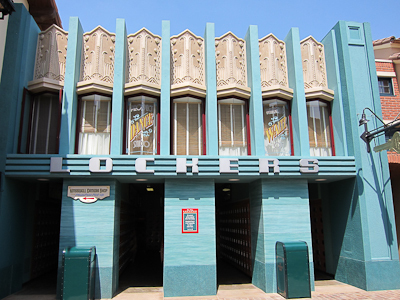 It will run up and down Buena Vista Street all the way to the Tower of Terror. 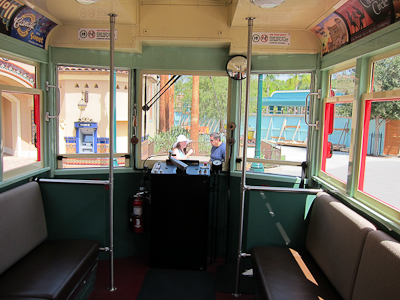 The interior of the trolley is fantastic too. 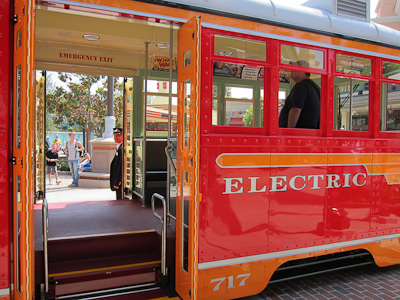 And seriously, it had that “new trolley smell.” Like the new car smell, except in a trolley. Heh. 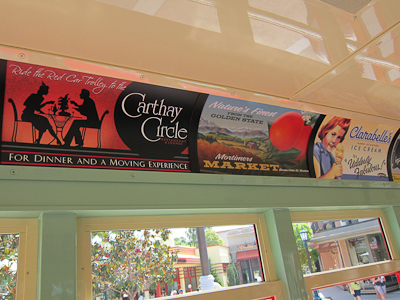 I really really really really can’t wait to eat at the Carthay Circle restaurant. The chef is the same one from the Napa Rose, and it looks amazing. 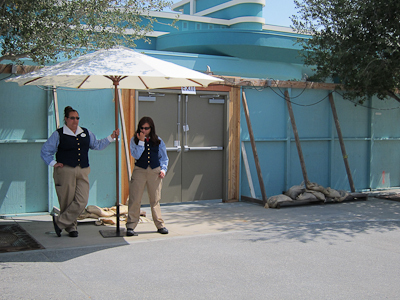 However, since it’s inside the park, we have to wait until Kevin’s pass is no longer blocked out. So, like, September. Ah well, it will be crowded this summer anyway. 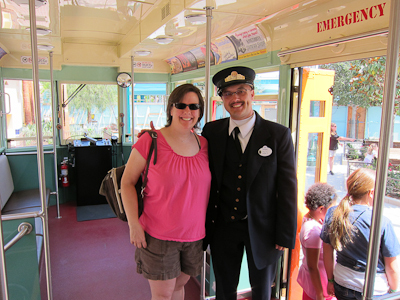 The trolley is fun to board and the conductors are really happy to be running it. And here’s a shot of the length of Buena Vista Street! 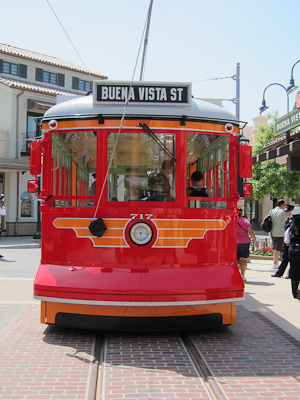 Stay tuned for more Cars Land/Buena Vista Street coverage! Shelby! Are you going to make Theo wait two+ months to ride the trolley? Maybe it’s time to spring for a Premium annual passport 😉 Actually, it will be crowded this summer, September should be much calmer and nicer. See you then? Thanks for sharing! I can’t wait to see it in person! Love it! (and the Cars Land post) Can’t wait to read more!